Twenty-five years ago today, the FBI performed a deadly siege on the private property of Randy Weaver and his family at Ruby Ridge. Randall and Vicki Weaver and their children wanted nothing more than to be left to live an isolated life in peace in their cabin enclave on a northern Idaho mountaintop called Ruby Ridge. Untrusting of the federal government and of the belief society had taken an insurmountable turn for the worse, the Weavers — as many residents in the remote and breathtaking area — taught their children to be self-sufficient and defend themselves with firearms from unwanted intrusions onto the family’s property. But the Weaver’s seemingly idyllic life came to an appallingly violent end over several hours from August 21 to 22, 1992, in a horrendously botched federal raid that would also profoundly alter perceptions about the U.S. government in the minds of even ordinary Americans. Often afterward reported to be white supremacists, the Weavers considered themselves race “separatists” only — and intended no harm against others beyond that belief — though their stance often included the company of people with a more vehement ideology. Regardless of the Weavers’ beliefs, the account of what federal agents perpetrated against the family under the premise of affecting law enforcement action implores Americans of every race to consider the telling outcome of untrammeled government power run amok. In 1989, Randall “Randy” Weaver came under the scrutiny of federal agents intent on infiltrating sometimes-violent white supremacist organizations like the Aryan Nations — and eventually wound up charged for selling two illegal sawed-off shotguns to an undercover agent with the Bureau of Alcohol, Tobacco and Firearms [now, also, explosives] (ATF). Weaver, notably, claimed he had been set up — thus flatly refusing the government’s offer to drop the charges if he would turn informant, feeding the feds information about various Aryan Nations members — and was indicted in December the following year. Though Weaver’s insistence about the set-up leaves his failure to show up for a scheduled court date in February 1991 an altogether open question, a clerical error marking that court date for March didn’t prevent authorities from issuing a warrant for his arrest. Knowing the Weavers possessed a relative arsenal — which Randall, Vicki, and their children were well-trained how to use — agents weren’t entirely sure how to carry out the warrant and so began intense surveillance of the family’s mountain home while carefully formulating a plan of action. Considering the family originally relocated to their outpost over mistrust of the government coupled with Randall’s claims concerning the charges which ultimately generated the warrant, Vicki’s language is understandable. Remember, whatever narrative about dangerous white separatists federal officials proffered about the Weaver family, Randall had only sold — under questionable circumstances — two sawed-off shotguns to a federal agent, and his failure to appear in court, for all intents and purposes, was the fault of the court clerk’s ultimately egregious error. All in all, an isolationist family on a remote mountain hardly posed an imminent threat to anyone. Nonetheless, federal marshals set in motion a plan in August 1992 that would send shockwaves across the country and around the world for its deadly ineptitude and wholly disproportionate use of force. On August 21, marshals surprised Randall, his 14-year-old son Sammy, friend of the family Kevin Harrison, and the Weaver’s family dog, Striker, on a road near the family’s property. Though some of what happened next remains a matter of conjecture, the events mark a disturbing turn in the use of force for the purposes of an otherwise relatively innocuous warrant. A fully camouflage-clad marshal shot and killed Striker — prompting Sammy to return fire at the group of marshals. Shots then rang out from both sides — in the end, both Sammy and U.S. Marshal Michael Degan lay dead. After the brief gun battle, Weaver and Harrison retreated to Ruby Ridge and marshals regrouped, bringing in FBI agents and setting up a sniper to watch movements on the property. One of the most contentious aspects of following events concerned an abhorrently arbitrary relaxing of the FBI’s rules of engagement to handle the case. Larry Potts headed the FBI’s criminal division and oversaw the deployment of the agency’s Hostage Rescue Team to break the standoff at Ruby Ridge — but in doing so, loosely nullified longstanding rules of engagement preventing agents from firing in anything other than self-defense. In doing so, Potts created a monstrously rogue agency capable of firing at will — and the results were expectedly disastrous. Agents were ordered to shoot any armed man on sight — on the Weaver’s private property — and when Randall appeared with a weapon alongside his 16-year-ol daughter Sara and Harris, FBI sniper Lon Horiuchi opened fire, hitting Weaver in the arm. Weaver, Harris, and Sara sprinted back to the safety of the cabin, but another shot from Horiuchi hit Vicki in the head, killing her as she clutched the couple’s 10-month-old daughter in her arms — but the bullet passed through her and also wounded Harris. An incredibly tense 11-day standoff ensued, as the terrified survivors holed up in the Ruby Ridge home, but ended when mediators convinced Randall to turn himself in. Horiuchi later claimed he had not been aware Vicki stood in the doorway when he fired the fatal shot. Though he was charged in 1997 with involuntary manslaughter for the killing of Vicki Weaver, a federal judge dismissed the charges the following year under the controversial alleged immunity of federal officers from state prosecution. In 2001, a federal appeals court overruled that claim to immunity, stating federal officials who violate the U.S. Constitution can, indeed, be held accountable at the state level — but the Idaho prosecutor never pursued the manslaughter charge. Randall and Harris both faced murder charges for the death of the federal marshall — but in a surprising move by an Idaho jury, all charges against them were dropped, save the original failure to appear charge against Weaver that generated the fateful warrant. Surviving members of the Weaver family filed a wrongful death lawsuit, and in 1995, the patriarch received $100,000 and three of his daughters, $1 million each. To this day, the grievous abuse of power fuels doubt in segments of the public about federal agencies’ ability to restrain itself in the use of unnecessary force disproportionate to putative threats. Though the enormity of consequences of Ruby Ridge certainly echoed far into the future, the events have unfortunately sometimes been clouded by the Weaver family’s controversial ideologies. But those beliefs — as the families of countless other victims of a growing epidemic of state violence can attest — are of little consequence when the government acts with reckless impunity against a wide range of people from grossly different backgrounds. Agents participating in and overseeing the siege of Ruby Ridge forced a sweeping internal investigation and concurrent reevaluation of policy — particularly due to the removal of imperative rules of engagement meant to protect civilians from the exact massacre that took place there. And as is widely known, when the government receives the green light to abandon strictures protecting the public one time, it’s virtually guaranteed to happen again. As testament to this, the deadly and terroristic siege in Waco, Texas, by federal agents occurred shortly after the incident at Ruby Ridge. On the 20th anniversary of her mother’s and brother’s murder by agents of the government, Sara Weaver poignantly recalled the harrowing details of her experience in an interview with the Associated Press — though she noted her father refuses to do the same. Losing her mother, who was indeed unarmed when she was killed, has been the most difficult aspect for Sara to come to terms with. 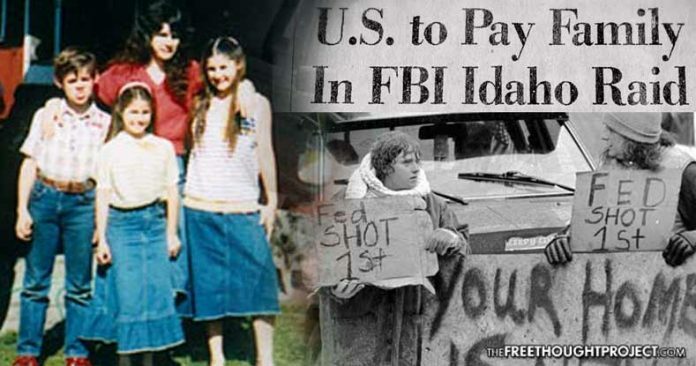 Despite the unprecedented mishandling, the payout to the surviving Weaver family, and the sh*tstorm of debate and controversy ensuing from the incident at Ruby Ridge, the government has never fully admitted any wrongdoing in the case. ← Neoliberal Race-Baiting/Race-War Mongering: Manipulate the So Called “Victimized Pot” to Hate and Attack the So Called “Privileged Kettle”!